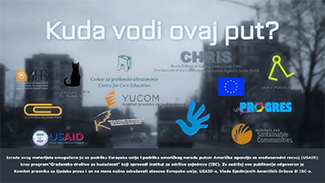 During a rare engagement between the Council of Europe’s decision-making body and civil society, human rights defenders and the Council of Europe Commissioner for Human Rights highlighted the need to support human rights defenders and raise awareness of their work in society. 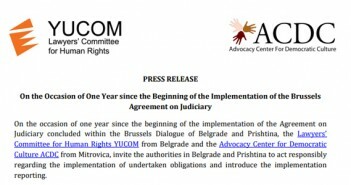 On the occasion of one year since the beginning of the implementation of the Agreement on Judiciary concluded within the Brussels Dialogue of Belgrade and Prishtina, the Lawyers’ Committee for Human Rights YUCOM from Belgrade and the Advocacy Center for Democratic Culture ACDC from Mitrovica, invite the authorities in Belgrade and Prishtina to act responsibly regarding the implementation of undertaken obligations and introduce the implementation reporting. Lawyers’ Committee for Human Rights – YUCOM informs the public that on Friday, November 2nd, the first criminal verdict was reached, where, imposing a sentence on a criminal offense, a hate crime, as a special aggravating circumstance, was taken into account. 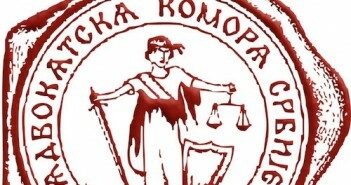 The draft law on legal aid is unclear and some parts of it are even unconstitutional, experts who took part in a round table said adding that despite shortcomings it’s good that the law is a step away from being passed in the Serbian parliament.